Sony has sold more than one million virtual reality (VR) headsets, the company has said. President of Sony Interactive Entertainment Atsushi Morita said sales had "exceeded our expectations". The headset, at $399 (£308), is cheaper than rival devices from Facebook and HTC. According to research company IDC, about two million VR headsets were shipped worldwide in the first three months of 2017. Mr Morita has high hopes for the technology. He said: "I believe that VR technology is the greatest innovation since the birth of television. "VR allows you to travel to World Heritage Sites or to space while staying at home. "It's like a time machine or a door to anywhere." There are two reasons why Sony is currently leading on VR, according to Piers Harding-Rolls, a gaming analyst at research company IHS Markit. 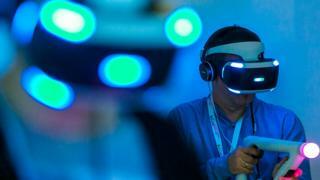 "Sony PlayStation VR is leading sales in the high-end sector because it is cheaper, but also because of Sony's addressable market of 60 million PS4 consoles," he said. Facebook's Oculus Rift currently has a $599 price-tag, while HTC's Vive is even more expensive at $799. Mr Harding-Rolls said VR was still a niche market but developers were beginning to come up with some interesting and immersive content such as the VR mode on the latest Resident Evil title, which he described as a "scary proposition". "I'm waiting for content that is truly transformational and original to VR," he said. "There have been games that hint at VR's potential, but there is still more to come I'm sure. "The introduction of peripherals with haptic feedback is a step forward, so it's likely we will continue to get games such as first person shooters being made that use these new technologies, but I'd also like to see more exploration based titles, which build on the immersion delivered by VR."